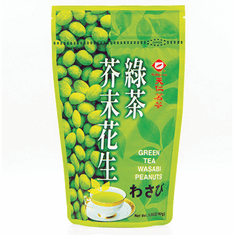 TenRen's Green Tea Wasabi Peanuts are tasty peanut treats with a crunchy, lightly sweet wasabi (Japanese horseradish) flavor shell tempered with green tea. Wasabi is the traditional green color horseradish that is popular in Japan and often enjoyed with sushi. It delivers quite a zing to one's taste buds. These wasabi peanuts come in a resealable zipper package.